Figure 1: Design for a study, featuring a variety of mathematical and geographical instruments. From 1705 to 1713, Schübler completed his education through extended travels through Germany, Denmark, Norway, the Netherlands, and France. While in Copenhagen, he deepened his interest in mathematics and physics, through his association with the astronomer Ole Rømer, and the royal mathematician and engineer Gamborg. After his return to Nuremberg, he referred to himself as a ‘mathematics enthusiast,’ and hoped – perhaps even expected – to be offered a chance to become a court architect. However, an opportunity of this sort did not arise until 1717, when he was asked to build a triumphal arch in Sulzbach. Though his work was widely praised, he did not subsequently gain a place in the Sulzbach court. Schübler was not offered a royal assignment until1740, when the Danish king called him to Copenhagen. However, Schübler declined the invitation, because a shipwreck that occurred during his previous voyage from Denmark had left him unwilling to travel by sea. Finally, in 1741, Schübler was asked to travel to Berlin, to work as an architect in the court of Friedrich II. Tragically, he died on 11 September of the same year, and was never able to fulfil this long-awaited role. Figure 2: Perspectival drawing of two gateway designs, including their respective plans and elevations. Despite never having worked in a royal court, Schübler was extremely productive during the first half of the eighteenth century. This does not mean, however, that his work was universally well-regarded. Despite his extensive education and prolific publications of domestic designs, architectural drawings, and textual works, his work was later described by the German art historian G.K. Nagler as in some cases representing the ‘senseless spawn of an unregulated imagination.’ Heinrich Gürsching gives the following reasons for the difficulties one encounters in trying to understand Schübler’s works: Firstly, even the artist’s manner of speaking – as demonstrated in the captions to many of his prints – was decidedly baroque, which Gürsching admits can make the works ‘difficult to enjoy.’ Secondly, they often require a great deal of prior technical knowledge to understand, making the significance of the works difficult for a layperson to realise. Though he spent the entirety of his professional life in Nuremberg, his largest and most often reproduced work was first published by Jeremias Wolff in Augsburg, before 1724. This publication, entitled Ausgab feines vorhabenden Wercks [Edition of fine intended works] was published in twenty editions, and presents designs for a vast array of objects, including altars, pipe organs, libraries, beds, clocks, garden gates, and fountains. According to Nagler, it delivers multiple examples of the lack of taste exhibited both by Schübler, and by the age in which he was working. The V&A holds a selection of the prints from the first edition, but only holds the entirety of the work as published by Johann Balthasar Probst, who inherited the plates from Wolff, his father-in-law. The following two engravings are selections from this edition. This print is the fourth plate from a series of six bedroom designs that Schübler produced for this publication. The design is indeed fantastic, with heavily ornamented drapery, cherubs and harpies at the foot of the bed, and even an all-seeing eye crowning the headboard. Most striking, however, is the large projection of a clock face, which illuminates the room, and demonstrates Schübler’s scientific interest and inventive spirit. The projector was invented in 1656 by the Dutch astronomer and mathematician Christiaan Huygens. This early version consisted of a long tube with a lens at each end, fitted into a lantern equipped with a candle and concave mirror. A groove in the middle of the tube held a glass slide, on which the image to be projected was painted. This device was termed a ‘magic lantern’ by Thomas Rasmussen Walgenstein, who demonstrated it throughout the 1660s in Rome, Paris, Lyon, and – most importantly for Schübler – Copenhagen. It is likely that Schübler was struck by the possibilities of the projector during his own trip to the Danish capital, on which he embarked less than fifty years later. As the ‘magic lanterns’ of the time could only display static paintings on glass slides, Schübler was clearly able to imagine a novel version of the device – one that could project moving images, like the face of a functional clock. This plate – the last of a set of six chimney piece and stove designs – stands in stark contrast to the bedroom design described above. Unadorned and strictly practical, this print is a perfect example of the so-called ‘Sparofenliteratur’ [Conserving-stove literature] that reached its peak in the 18th century. Texts and images belonging to this genre were concerned with conserving the limited resource of wood, as it needed to be used not only for fuel, but also for building materials and trade. Because the energy usage of individual households was most easily managed, numerous, sometimes richly illustrated works about household stoves were published. Schübler’s inscription to this particular stove design reveals that it shows a ‘very special refining furnace, in which the smoke must complete its course in such a way that almost all of its heat can be utilised.’ What is striking about this print, especially when compared to Schübler’s other works for the Ausgab feines vorhabenden Wercks, is the complete lack of his characteristic excess of ornamentation. Heinrich Gürsching writes that each of the designs in this publication was intended to provide as much inspiration to contemporary craftsmen as possible, rather than to fulfil an immediate aesthetic purpose. This appears to be especially true in the case of this print. The inscription continues by informing the viewer that Schübler has ‘already opened this invention to several educated builders with more information than the space here allows,’ and that he hopes that ‘one will be able to erect this advantageous stove … in the correct way that [he] ha[s] achieved.’ As this inscription is one of only two in the Ausgab that is written in the first person, it is clear that Schübler felt a strong attachment to this particular design, which is strikingly modern both in appearance, and in its dedication to energy conservation. This print from Schübler’s first major text work, Perspectiva Pes Picturae, though it is not yet nearly as innovative as Schübler’s later works, is more revealing in terms of the artist’s architectural talents. Appearing in two parts between 1719 and 1720, Perspectiva was an oversized, luxurious work that seemed more akin to the ostentatious books of the previous century. It contained a written history of the studies of geometry and perspective, and was supplemented by a number of illustrations used by Schübler to demonstrate the ways in which these studies should be applied to architectural drawing, specifically. This print is a composite image of two elaborate gates, along with their respective plans and elevations. 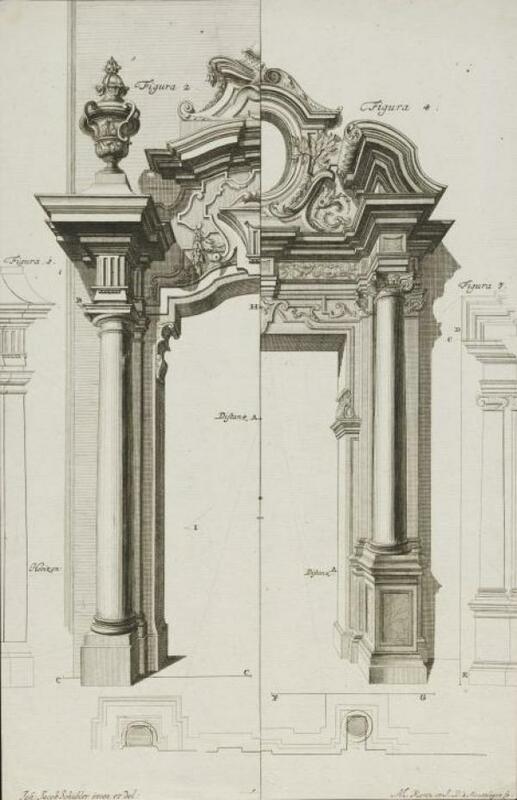 The design on the left side of the print, which he described as ‘a newly invented portal for the entrance of an orangery,’ drew on a similar gate designed by Leonhard Christoph Sturm. The design on the right, on the other hand, was original, and intended for the entrance to a grotto. Utilising both examples, Schübler hoped to prove that a return to the mathematical origins of proportion and perspective could resolve any number of architectural problems. In the subsequent text of Perspectiva Pes Picturae, he attempted to make these principles not only understandable, but also teachable to architects and builders. Gürsching claims that this didactic desire to examine perspective, proportion, and design not only in terms of basic measurements, but also in terms of theoretical arithmetic, is the common strand that unifies all of Schübler’s output. In fact, Schübler’s artistic philosophy is perhaps best demonstrated in this highly allegorical title plate of Perspectiva Pes Picturae. As he explained on the following page of text, the sleeping figure with the dog at her feet represents Memory – the nail in her hand referring to an ancient practice of driving a nail into a temple annually, to mark the passage of time. Behind her, the figure of Arithmetic – dressed in regal robes and holding a master key – attempts to rouse her from her sleep. On the floor lies the figure of Attention, lost in books of conventional theorems, and gazing toward the other related disciplines – Art, Weights, and Measures. On the steps above these, the figure of Architecture holds a drawing in one hand, and uses the other to present the tools of her trade to Perspective, who carries an all-seeing eye on top of her head. Here, Schübler has managed to assert perspective’s dominance over architecture, and arithmetic’s ability to ‘unlock’ ancient memories of the time in which perspective was born. In true Enlightenment fashion, he based his mathematical treatises on those first discovered in Antiquity – in his case, particularly those of Pythagoras. In this, the first page of his first major work, Schübler has, in a way, summarized his entire output. The inventiveness of his later designs – the modern-looking projector and stove, for instance – was as much guided by contemporary scientific innovation as his architectural work was ruled by ancient mathematical principles. Though sometimes obscured by the extensive ornament he favoured, it is clear that Schübler’s early interest in maths and science remained firm throughout his career, enabling him to produce works that are practical as well as decorative – a perfect balance between the Late Baroque and the Age of Enlightenment. Staatliche Museen zu Berlin, Katalog der Ornamentstich-Sammlung der Staatlichen Kunstbibliothek Berlin (Utrecht: HES Publishers, 1986), 98. D. Guilmard, Les Maîtres Ornemanistes (Mansfield Centre: Martino Publishing, 2009), 427. Heinrich Gürsching, ‘Johann Jakob Schübler: Ein Nürnberger Baumeister des Barockzeitalters,’ Mitteilungen des Vereins für Geschichte der Stadt Nürnberg, 35 (1937), 19-20. Gürsching, ‘Johann Jakob Schübler,’ 22. Gürsching, ‘Johann Jakob Schübler,’ 23. Gürsching, ‘Johann Jakob Schübler,’ 23-30. G.K. Nagler, Neues Allgemeines Künstler-Lexicon, vol. XVI (Munich: E.A. Fleischmann, 1846), 38. Gürsching, ‘Johann Jakob Schübler,’ 33. Nagler, Neues Allgemeines Künstler-Lexicon, 38. Nagler, Neues Allgemeines Künstler-Lexicon, 80-81. Frances Terpak, ‘Magic Lantern,’ Devices of Wonder: From the World in a Box to Images on a Screen (Los Angeles: Getty Publications, 2001), 297. Gürsching, ‘Johann Jakob Schübler,’ 44. Gürsching, ‘Johann Jakob Schübler,’ 40. Johann Jakob Schübler, Perspectiva Pes Picturae (Nuremberg: Verlag Johann Christoph Weigel, 1719), 8.